GiftsForYouNow.com features fine quality photo canvas options with a classic gallery wrap. 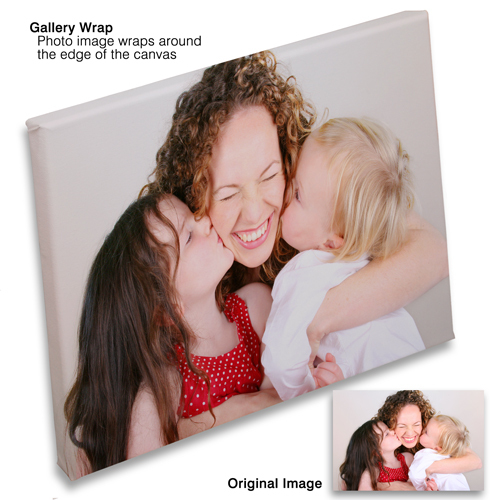 The gallery wrap allows for your favorite digital photo to decorate the entire visible canvas area. Your photo canvas displayed on any wall with or without a decorative frame is a personal work of art. Selecting the proper digital photo. We recommend selecting a photograph featuring the main subject centered and with ample background. This combination provides the optimal setting for creating your gallery wrapped photo canvas. 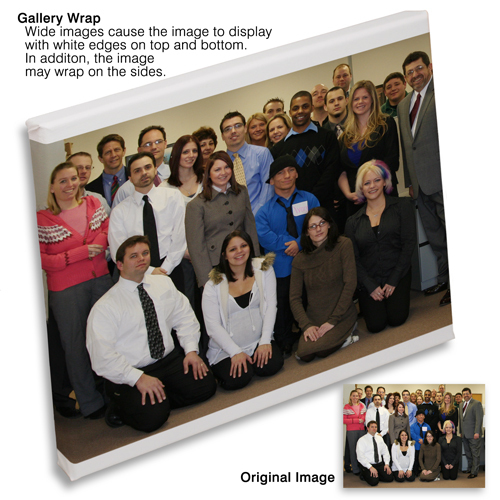 When selecting a digital image of a large group for a photo canvas we recommend having ample background around the entire group. The additional background allows for the entire group to appear on the canvas and for the background to naturally wrap around the edges completing the photo canvas. When a large group image contains subjects along the edge of the photo the subjects may be displayed on the outer edge of the canvas. In addition, many times this type of image creates a white edge on the top and bottom of the canvas due to the image ratio not corresponding to the canvas frame size.